In post-apocalyptic cinema the slow sweeping shot of a half-submerged shopping cart in a river is a standard – just before the horde of zombies lurch onscreen. Symbolic of consumerism under late capitalism, in these films the shopping cart is a marker of our (lost) civilization. 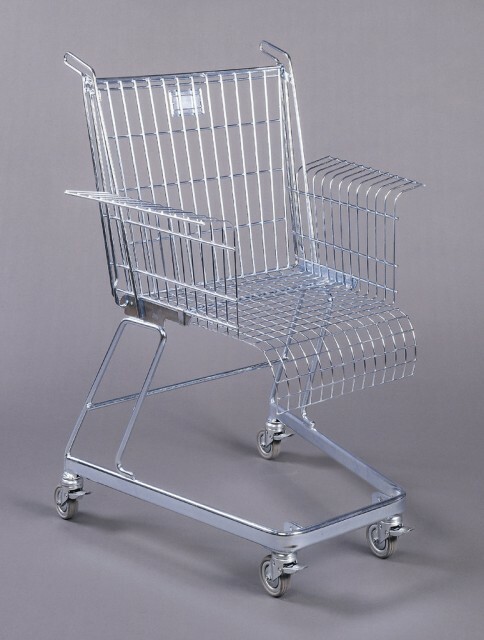 Shopping carts also evoke memories of childhood – hours spent strapped into uncomfortable seats, being pushed around endless shopping malls and supermarkets. For me, though, it is Berlin's experimental musicians Einsturzende Neubauten ('Collapsing New Buildings') who brought shopping carts into memorable focus. Their live concerts in the late 1980s and early 1990s combined the brutal power and force of industrial tools – angle grinders, jackhammers, sledgehammers – with the comparative delicacy and 'ordinariness' of shopping carts played like harps. Sculpting sound from destruction and urban waste, Einsturzende Neubauten was far from folksy concepts of 'junk percussion'. In this performance of their 1987 song Zerstörte Zelle ('Destroyed Cell'), the generic shopping cart becomes a key instrument. New shopping carts redesigned by IDEO on ABC's Nightline TV show in 1999 along with the multi-award winning colorful, bubbly Target redesigns in 2006 would both fail in such a musical or cinematic contexts. "Consumer's Rest", is a 1983 design from Berlin's Stiletto Studios acquired by the museum in 1992. Like the zombies, it has lurched its way to the top of our online leaderboard in the past few months driven by an unprecedented interest in it on Tumblr. Decontextualized from the museum, its image now drifts in the seas of Tumblr where it has accrued 46,115 reblogs and a quantum more views. Strangely, though, it barely registers any concurrent interest on the museum's own Object of the Day blog where it was first posted on April 12, 2014 (read 93 times), nor in the museum's own collection database (viewed 23 times) between April 1 and today. Things are different, it appears, not only online but also 'where' online. Digital humanities professor at University College London, Melissa Terras, asks about institutions' 'most wanted' as a way of probing issues of 'shallow versus deep engagement' and the different publics for our collections. She writes "Asking to see Digitisation's most wanted opens up wider questions of public engagement, the impact of social networks on internet traffic to digitised collections (from highlights posted by the institution, to those identified and shared by others outside it, often quite unexpectedly), and the role of making images of primary historical sources open for others to discover, use and share." What will be our next unexpected Tumblr success? "Shopping Cart at Willets Point" by Seven Train Photos, 2005, CC-BY-NC-SA.